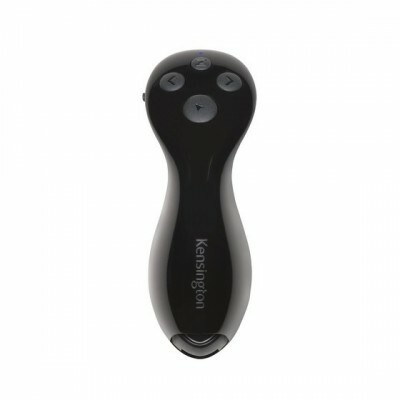 The Kensington Ultimate Presenter with Virtual Pointer is an innovative presentation tool that works for a variety of environments and screens. Overcoming the shortcomings associated with traditional laser pointers, such as bright LED screens or safety restrictions, the Ultimate Presenter is optimised for use in conference rooms with TV displays, online meetings with remote participants and large auditoriums with multiple presentation screens. Complemented by versatile storage options and the KensingtonWorks software, the Ultimate Presenter is the ideal presentation tool for todayâ€™s digital world. Optimised to work with macOS, Windows,and leading presentation software such as PowerPoint, Keynote, Adobe PDF and Google Slides. - Virtual Pointer Technology works on a variety of presentation screens including traditional projection screens, TV displays, bright LED screens and smart boards, making it the ideal pointer for every presentation scenario, including conference rooms, online meetings and large auditoriums. - KensingtonWorks Software enables customisation of pointer size, shape and speed to suit your presentation environment, and additional options, such as configuring the blackout button to start and end the slide show. - Ergonomist approved design features a contoured shape to minimise wrist twist and maximise comfort with an intuitive 4-button layout. - 2.4GHz receiver with MicroSD card provides up to 20 metres (65ft) of wireless range, expandability to 32GB of memory and a plug & play user experience. - Storage Pouch conveniently stores your presenter in a soft travel pouch. The pointer can be seen on a variety of presentation screens, including traditional projection screens, TV displays, LED screens and smart boards. Ideal for conference rooms with digital screens, online meetings with remote audiences,and large auditoriums with multiple display screens, this pointer overcomes the limitations of traditional laser pointers and allows you to present anywhere. Personalise your clicker by customising the size, shape and speed of your pointer to suit your presentation environment, and adding additional options, such as configuring the blackout button to start and end the slide show. Designed to maximise your comfort, the contoured shape reduces wrist twist and features an intuitive 4-button clicker to simplify your learning curve. Offering you a plug & play user experience, the receiver MicroSD card provides up to 20 metres (65ft) of wireless range, expandability to 32GB of memory. Supports leading presentation software, such as PowerPoint, Keynote, Adobe PDF and Google Slides to provide you flexibility in your digital world. Conveniently store your presenter in a soft travel pouch while on the move.